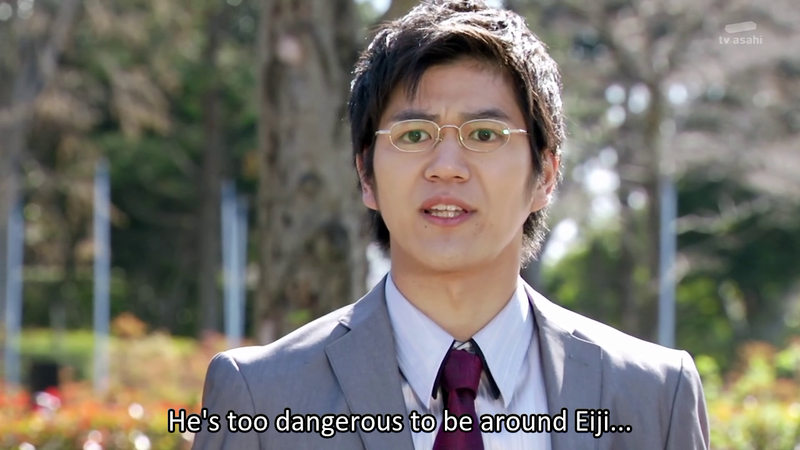 And apparently Eiji was not as lame as I assumed. 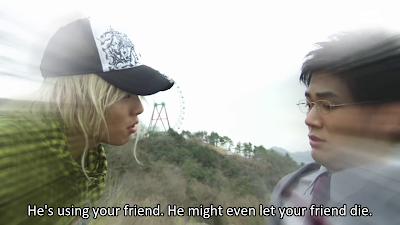 He DID consider Yuuichi as friends. 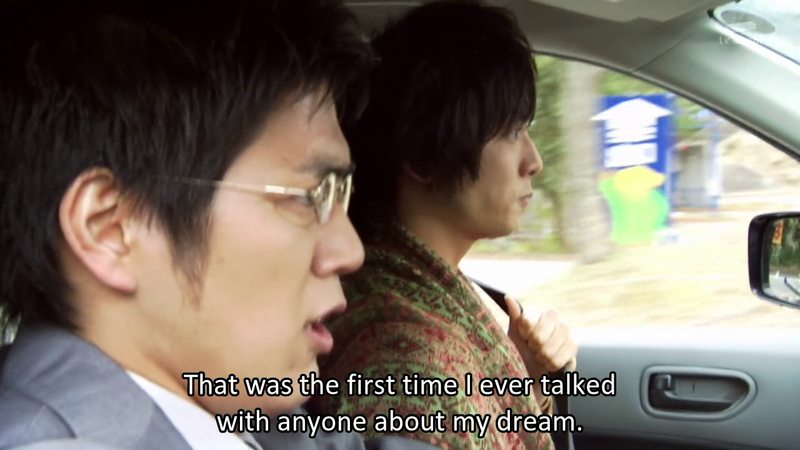 He even remembered the time they went to a theme park together, and it was one of Yuuichi's best moment in his life. Thanks to Yuuichi's memory, they went to the Green House and discover the others, and confronted the Yummy. 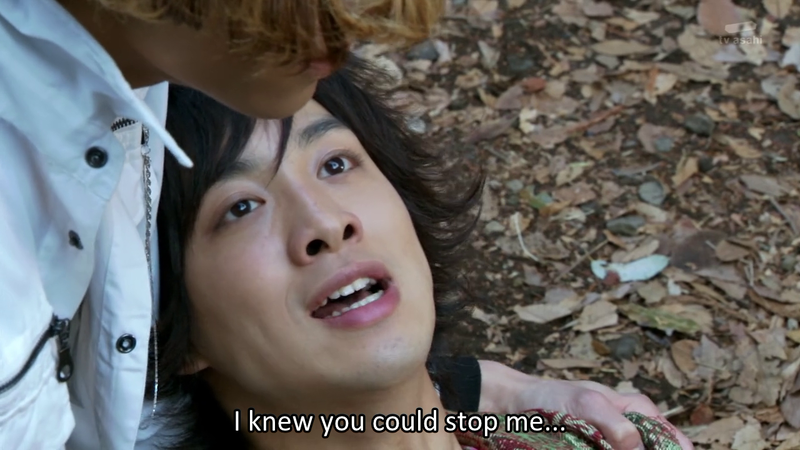 It was then revealed that Cazali had warned Yuuichi that Ankh was only using Eiji for his personal needs. With that thought, the Owl Yummy took Ankh away as hostage. Apparently, that was Cazali's intentions after all. 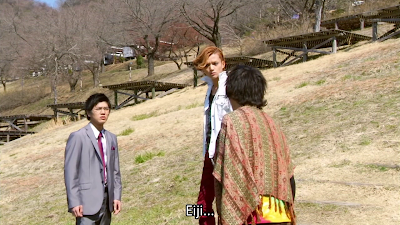 Eiji, Date and Gotou ran to help Ankh, but Yuuichi stopped Eiji. He told Eiji to leave Ankh alone because he was just using him. 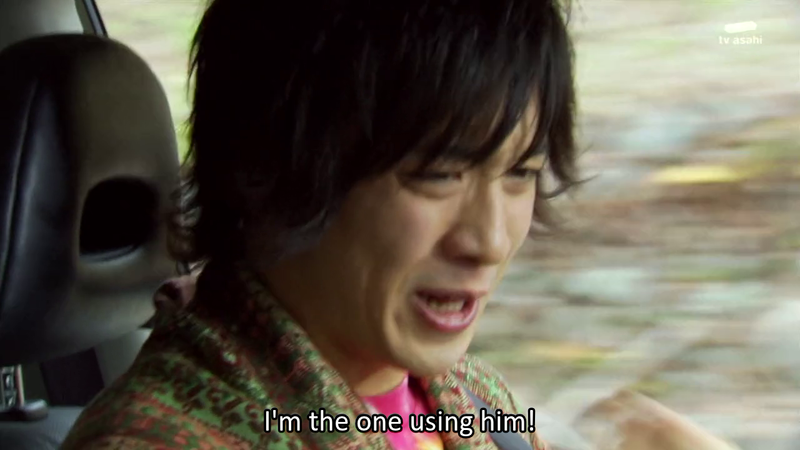 He was the reason that Eiji jeopardizing himself for such fight. 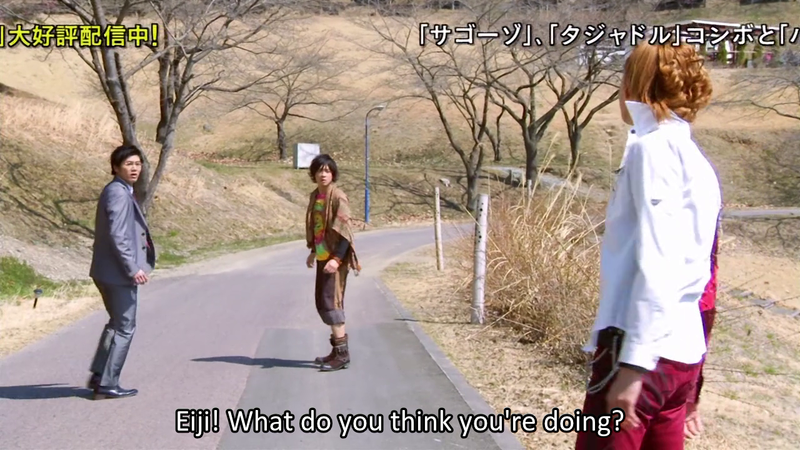 Ankh managed to send a Hopper Candroid to alert Eiji his location. Yuuichi arrived in his car to carry Eiji to the location. 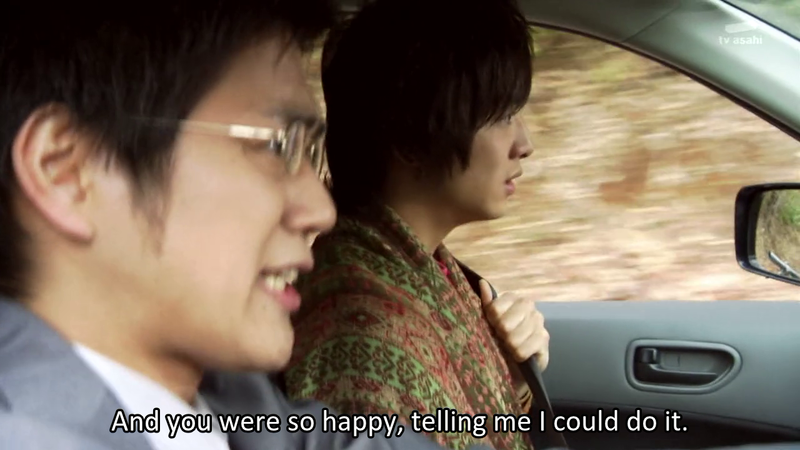 On the road, Yuuichi confessed his initial true feeling about Eiji, and how he then finally sees him as his best friend. Yuuichi: Y'know, I hated it when you came to my house. "Why is he bothering me? I want to be alone. 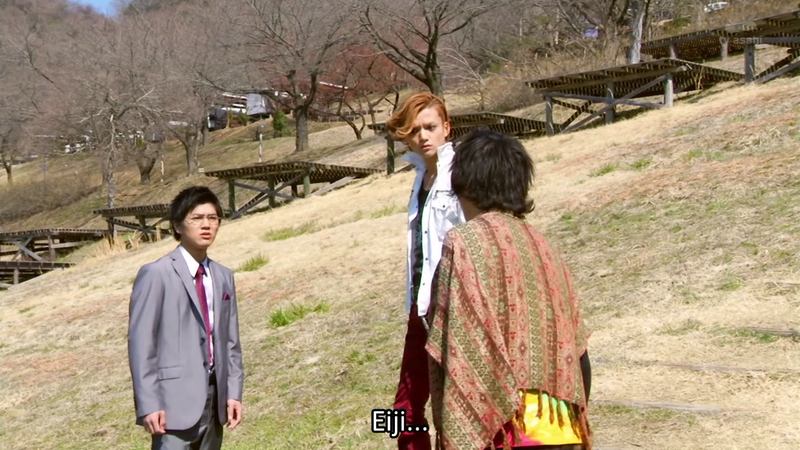 Give me a break"
Eiji: I guess I was meddling, huh? 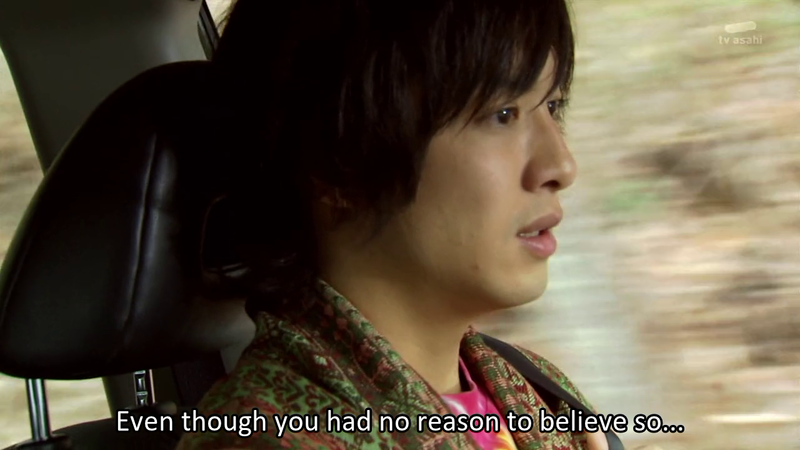 Yuuichi asked the reason why Eiji helped Ankh, because he feels that Ankh was just using him. 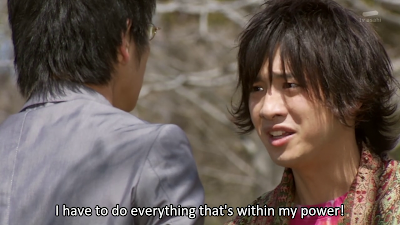 And Eiji confessed his true reason of becoming Ankh's partner, as well as agreeing to become Kamen Rider OOO. The situation was fierced because Eiji only has 2 medals in his hand (thanks to Yuuichi) but Eiji managed to summon the power of PuToTyra and went berserk to defeat the Yummy, and drove Cazali and Lost Ankh away. Cazali's intention to fuse the two Ankh together has failed. However the berserk OOO started to attack Yuuichi. Ankh distracted him, to chase him instead, and so they faced each other. Desperate to wake Eiji from the berserk combo, Ankh confessed his true feelings about Eiji. Ankh: I don't care what happens to you, but know this! I will be restored, no matter what! And I need your help to do that! 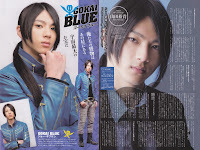 A strong clash between them, released Eiji from the combo. Although depowered by the combo, Eiji managed to speak about his faith for Ankh, before he passed out. 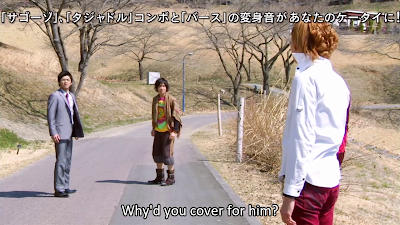 Yuuichi looked sadly at the way Eiji relied on and trusted Ankh that much, and walk away silently. Okay, so what I didn't really get, and the thing that I'm curious the most to know is what happened to Yuuichi afterward. 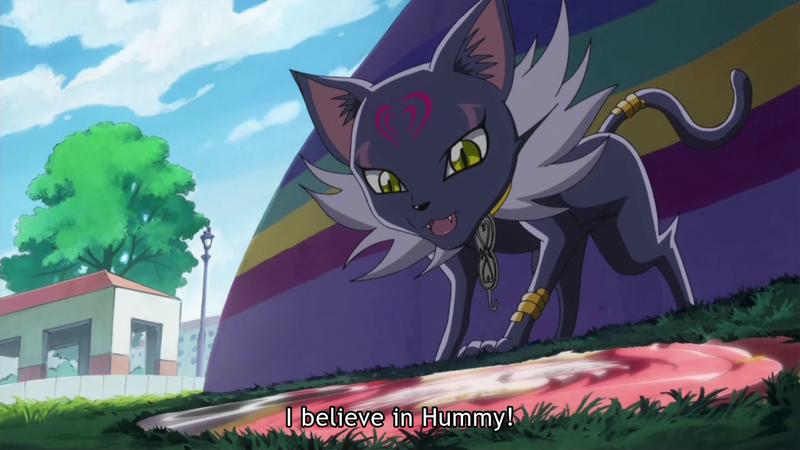 But unlike previous episodes where the focused character has a proper conclusion (whether what they will do next, or where they will go after), this question is never answered. Really feel bad for Yuuichi because of that... He was actually a nice guy with a nice intention but in the wrong way. 2. 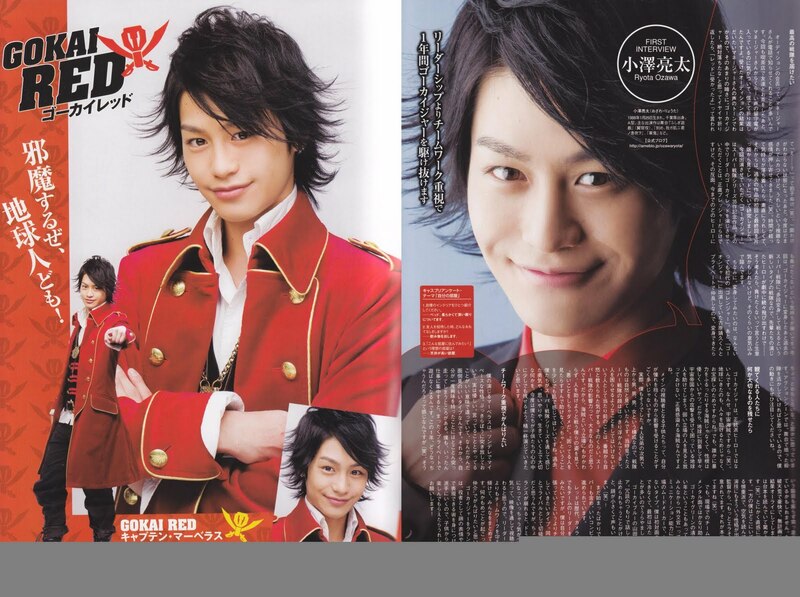 Yuuichi. The guy who on the other hand, saw that action differently. The result is that he really wanted (yes... that's the correct verb) Eiji to be his best friend. Why? 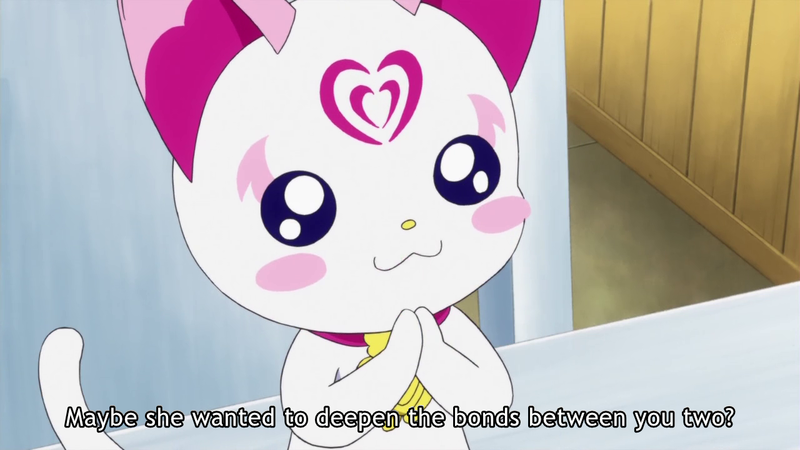 Because only to Eiji that he managed to open up. Quite similar to the character Homura from Puella Magica Madoka. 3. Yuuichi grew with a purpose to be big, and wanted to return the favor, so that this time Eiji can rely on him back. He actually cares for Eiji, because he doesn't want Eiji to get hurt, he even wanted to make Eiji's dream come true. 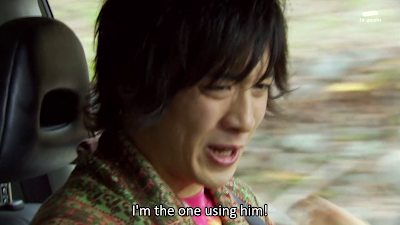 He IS doing what a best friend would do... but does Eiji sees him the same? 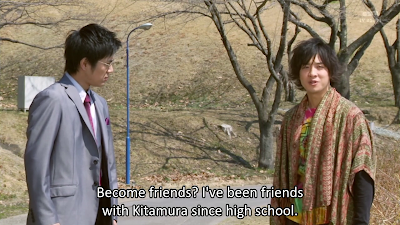 I think Eiji sees him just the same as his other friends... T.T A one-sided best friend? 4. 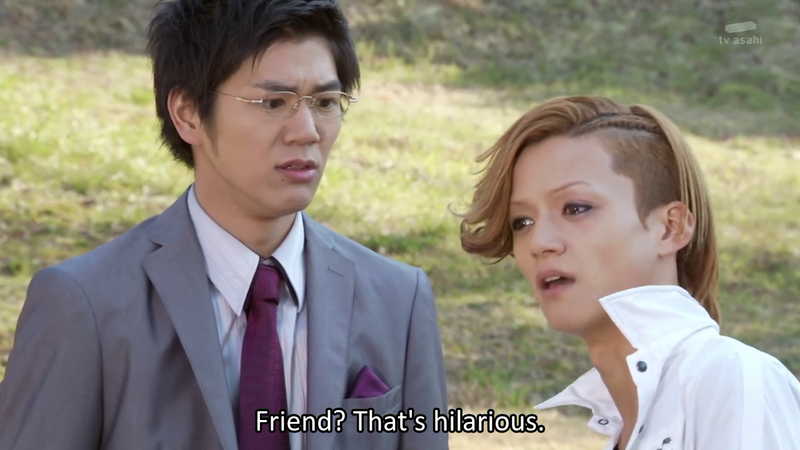 Ankh, DOES not see Eiji as friend, because he doesn't believe in friendship. However, Eiji seems to trust Ankh more than Yuuichi, why? 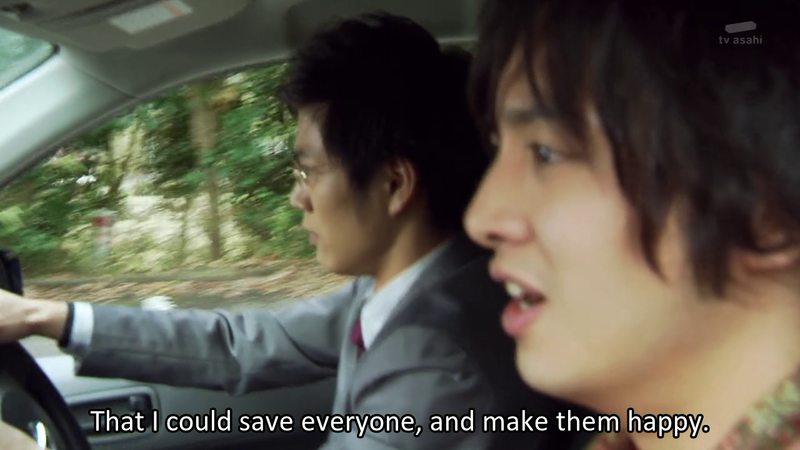 Because Ankh and Eiji has MUTUAL NEEDS. Not in a "A Friend in NEED is a Friend indeed" way, but because they are both using each other to fulfill their needs. 5. The relationship between Ankh and Eiji is pure mutual self interest. 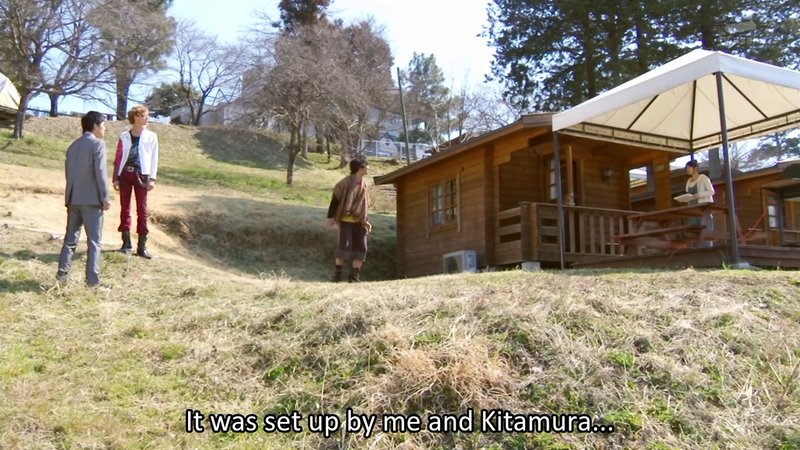 This put Eiji in different when compared to last year's epic Kamen Rider show, where the bond of TRUE friendship between Shoutaro and Philip/Raito as Kamen Rider W was very very strong, eventhough fans called it bromance-like. So there it is, as I noted last week, all 2 shows plus Suite Precure all shared the common theme. I think it's rare, and I don't know if its coincidence or something that TOEI definitely planned, but there are lessons that we can obtain from these 3 shows. So finally, to wrap up this trilogy post... let's review together the types of FRIEND that the 8 characters in the spotlight from the 3 shows reflect... 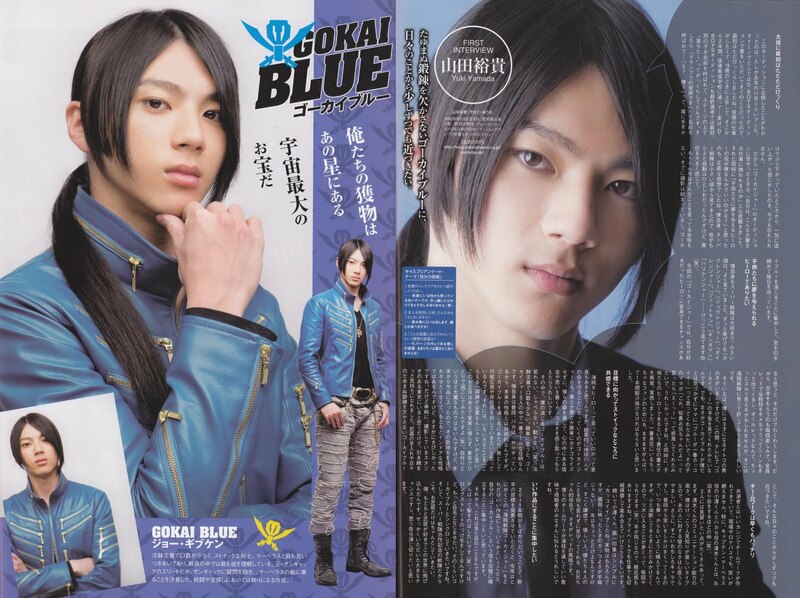 I'll start off with Suite, then Gokai and then finally OOO. Eventhough he hid his emotion so good, that he always prefer to be the tsundere, loner, cool guy that seemed like he never needed anyone else, Joe actually cared so much for friendship. His heart was touched by Cid eversince Cid stood up for him, and they grew together not only as best friend, but as brothers. Joe looked up for Cid so much. That's why he was so crushed and devastated upon learning that Cid was turned into a mindless cyborg Barizorg. He tried so much, with all his might to rescue his friend. Beside Cid, the same thing happened with Marveloud. He valued Marvelous action when he decided to risque his own life to destroy the chain in Joe's neck, and accepted the offer to live Marvelous dream. 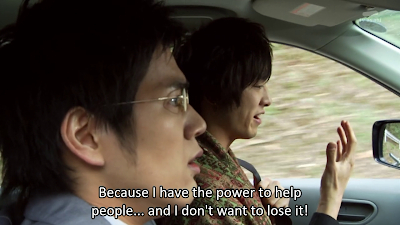 Joe's an awesome friend indeed, because he stood up for Marvelous to guard his back. Eventhough we didn't get too much background story about this character, but Cid proved himself as a very worthy brother that Joe looked up to. He stood up for Joe's sake, trained him well, guided the lost kid, and ultimately sacrificed himself to deliver victory in Joe's escape. If Cid would have been able to escape together with Joe, they would made an awesome duo because they trusted each other so deep. Despite his appearance now as Barizorg, there were hints that Cid never actually lose his memories. Barizorg seemed to remember Joe as he warned his general to be careful with Joe. 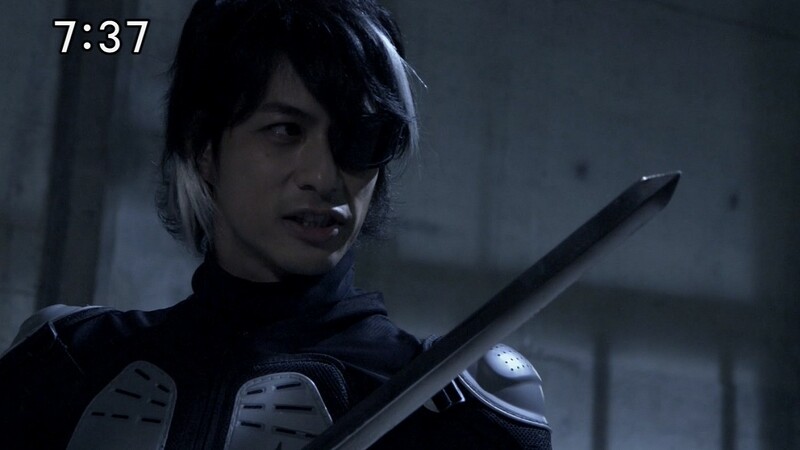 Beside that, when confronting Joe alone (when he begged Barizorg to return to Cid), Barizorg held back and hesitated that he didn't even try to kill his enemy. Is that a sign that he still actually cared for Joe? We'll see to it later on. After he received the ranger key chest, he saw Joe's running away from his chasers, and that was the moment that Marvelous knew that he wanted Joe on his side. It was a fated meeting, their meeting was fate, and how Marvelous connected with Joe was by fate as well. I mean, they were complete strangers when they first met, but at such instant moment, trust and faith grew between them. I guess it was friendship at first sight, huh? Eventhough he was a badass, that seemed to only care about himself, he risqued his own life unplugging the chain from Joe's neck. He even shared his dream to Joe, and asked him to help him. Furthermore, when Joe ran away to face Barizorg, without even has a slight of doubt, Marvelous believed so much Joe will return to guard his back. The power of faith ran through Marvelous, for he showed us how he trusted and believed in his best friend so much. Eiji wanted to save the world, and that includes saving others and making them happy. The term Others means everyone, nonetheless, so it goes to some guy he ran to at a convenient store, a thief who tricked him, some guy that helped him to go to Thailand, a girl who longed for her brother, some high school friend who locked himself away from others, and even an ancient Greed monster that only wanted to restore his original body. 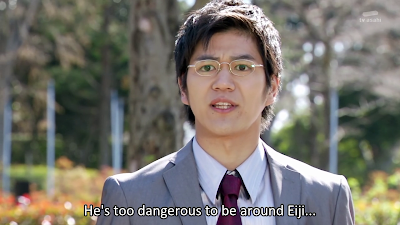 Eiji is the type that is nice to everyone, but I don't think he has closer friends than that. All in Eiji's mind was helping others, and knowing that he has the power to do that as Kamen Rider OOO, he used Ankh to use him. 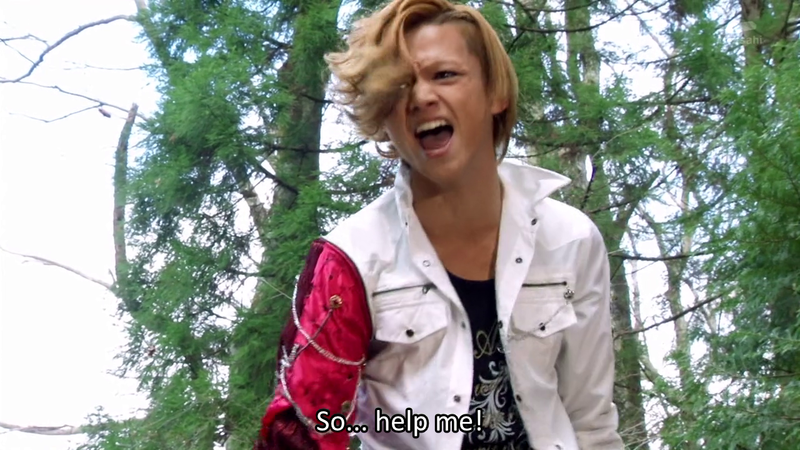 Ankh, Hina, Yuuichi, Date, Gotou.... everyone is the same level for him. A Friend. Period. As a greed that came from ancient time, Ankh's goal was only to revive his full self, and to consume all the power to his own. Unfortunately, he was awakened with a glitch, that he needed to use Eiji to help him reach that goal of his. 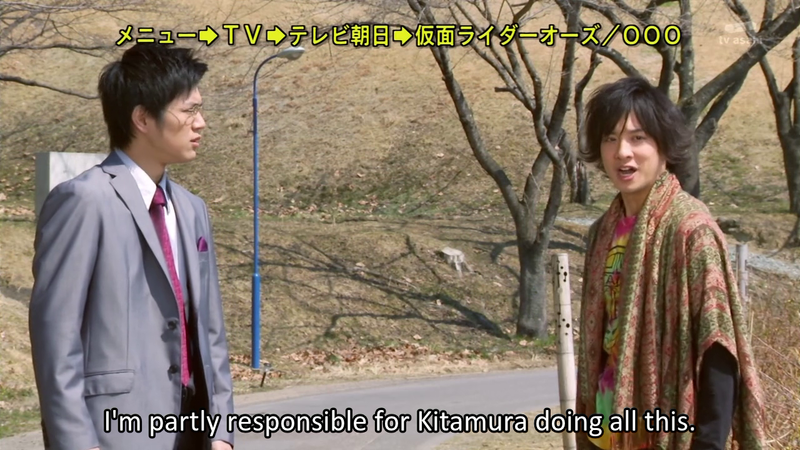 While he doesn't care for Eiji, or what happened to him... 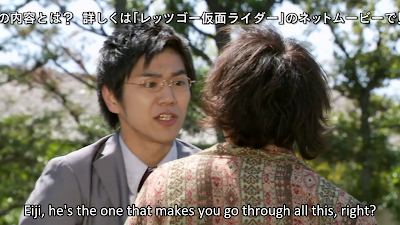 He does care if Eiji overused himself using the combo, because it will jeopardizing his use as a medal container. 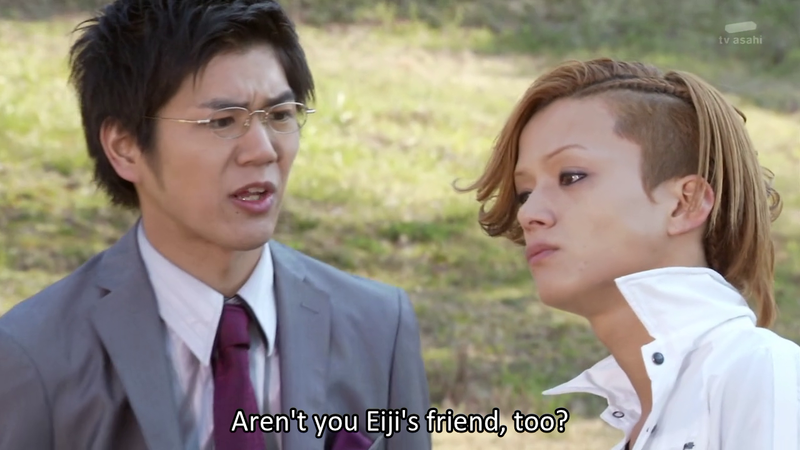 Suffice to say, Ankh doesn't value friendship, but he values Eiji simply because he needs his help, because he needs Eiji's power. Where else can he find a stupid guy who is willing to sacrifice himself for others. Everything changed to this social hermit, when Eiji broke his barrier of solitude in high school. Yuuichi didn't care of others, and just wanted to be alone, but Eiji kept on coming to his house with bright smile. 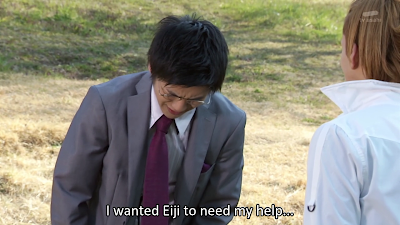 I guess with all the attention, Yuuichi ended up opening his heart to Eiji, and started seeing him differently, and eventually cared so much for Eiji that he wanted to live up Eiji's dream as he build up his. I think it was obvious that Eiji was his only friend, the only friend in his eyes that he could trust, that's why he claimed Eiji as his best friend, eventhough I'm quite sure he didn't feel that Eiji saw him the same way, ever. As I said earlier, Eiji is everyone's friend, he's everyone's best friend, that's why Yuuichi's big desire is to have a 'true' friendship with Eiji. He wanted Eiji to acknowledge him back, so that this friendship is not a one-sided. There they are, and as I said earlier... all of these come from my point of view, my perspective. A fragile heart that longed for a reunion with her best friend. A sincere heart that believed her best friend with all her faith. A loner who valued the sake of his comrade and his brother-like friend that willing to give his life for them. A guy who looked up and cared to protect his best friend as an older brother. A laid-back guy who actually have great trust and faith for his friend that he met by fate. A guy who is everyone's friend and see them all equally. A guy who build his 'friendship' to fulfill his goal and need. And finally, an outcast who wished to be acknowledged by someone he cared so much just so he was sure that he actually have a true friend. And what kind of relationship that these guys showed us? A broken childhood best friend (Siren-Hummy). A brother-like best friend (Cid-Joe). Best friend by fate (Joe-Marvelous). Friends for need /Yup, not IN need (Eiji-Ankh). 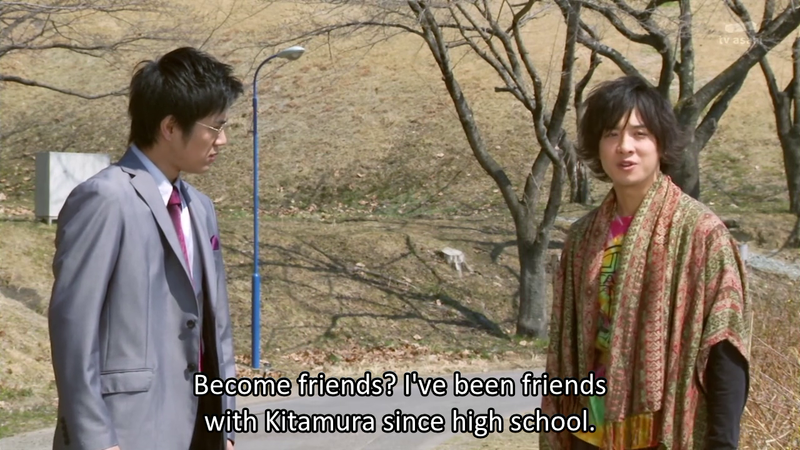 Finally, One-sided best friend (Yuuichi-Eiji). 1. Which one of them do YOU see yourself? 2. Which one of them do you prefer to be YOUR best friend, if you have the gift to choose? 3. Which one of them do you feel UNWORTHY to be called a friend, nor a best friend? 4. How do you see the term BEST FRIEND upon viewing the sample these characters showed? Which one is the best? Oh and remember, it takes two or more to build a true friendship. It doesn't work only one way, it has to go two ways in return... Just a little note to help you remember the basic foundation of a friendship.